What Should You Know About The Wrong Way Sign? Wrong-way driving is basically when you are driving a vehicle against the direction of regular traffic. It can happen on one- or two-way roads, in parking lots and garages as well. Wrong way driving is often due to driver impairment or inattention, due to confusing road signs or markings, or if a driver is not familiar with right-hand traffic. Some people may intentionally drive in the wrong direction, due to thrill-seeking, to take a shortcut or for a suicide attempt. 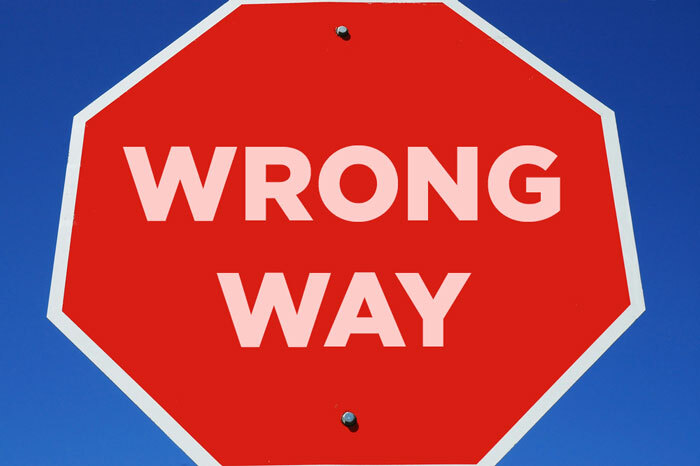 Wrong-way driving is often a serious problem on freeway, or divided-highways, since the chances of causing accidents or head-on collisions are greatly increased. In the United States along, nearly 400 people are killed each year due to accidents that are caused by wrong-way driving on highways. Many drivers simply enter a divided highway in the wrong direction and then fail to correct themselves by turning around. Wrong-way driving is a punishable offense and is counted as careless driving, which can result in imprisonments or fines. How Can Drivers tell if they driving wrong-way? There are lots of instances in which drivers can mistakenly drive wrong-way, even if they aren’t impaired. The stop sign is fairly common and will be shaped in an octagonal design, will be red in color and will have the words ‘STOP’ printed right in the middle with white letters. The sign indicates that the driver must stop immediately, before the white limit line on the road. If there is no line drawn, then you have to stop at the corner of the road. The yield sign will be shaped in an upside-down triangle and will be yellow or white in color with a red border. This sign indicates that if other pedestrians, bicyclists or vehicles are on the road, they may have right-of-way. You should slow down if you see the yield sign and let others pass or overtake you. The Wrong-Way or Do-Not-Enter sign will mean that you are driving into oncoming traffic or you are entering into a restricted area. These signs can be seen in drive ways or alleys and you should always backup or stop when you see these signs on the road. You should definitely brush up on your road sign knowledge in order to avoid getting flagged for irresponsible driving. Knowing what each sign means will ensure that you drive safely.